By now anybody who reads in these parts must know that I have developed an obsession for a woman in a book called Nahui Olin by Adriana Malvido. I have called these multiple blogs The Warmth of Mexico. I am getting close to the kill if my friend Bronwen takes the bait. She wrote of her “problem”(one of being exquisitely beautiful) here. We attempted (and failed) to take photographs that would cast her in unflattering portraits. All the time I was wrong in my approach. 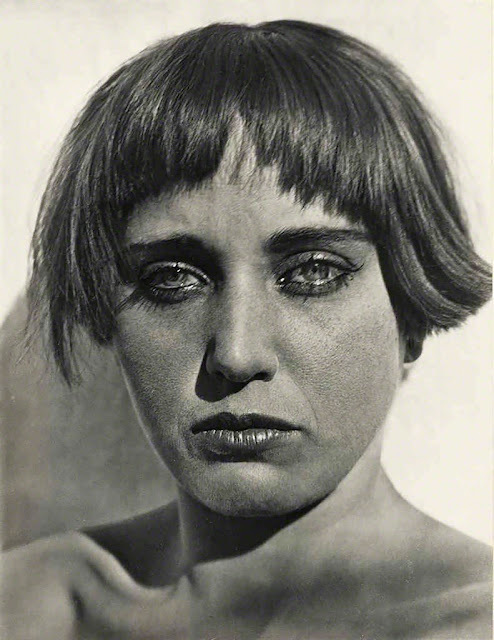 Edward Weston knew best when he photographed Nahui Olin in 1924. She of the beautiful face with lovely (and unearthly green eyes) was rendered, not, with the harsh light of a Mexican sun posing by leaning on a wall which would have been in the azotea (roof) of his Mexico City home. The most talked of photographs in the exhibit are the heads of Galván, Lupe and Nahui Olin, and several of Tina [Modotti]. The clouds excite much interest, praise and comment; also the new work with my Mexican toys. Nahui is a bit “enojado” – annoyed – that I should display such a reavealing portrait of her, though I had her permission before hanging…Now she wishes me to do nudes of her – and I shall. Several sittings seem assured as the result of my show, so for a while yet we eat and pay rent. If Browen accepts my request I will wait for a sunny Vancouver day and attempt to make Bronwen in what she is probably not. Even if I fail there will be that inspiration of her face and blue/green eyes which certainly give Nahui Olin competition.